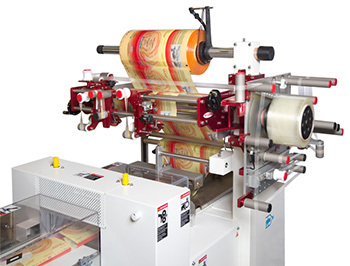 The applicator is mounted at the film unwind area of the wrapper. 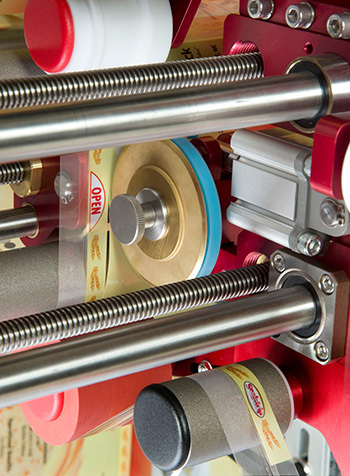 The applicator runs at your current line speeds and is designed to fit your wrapper. The resealable feature graphics are printed in an additional 0.5” width of your packaging film, producing a resealable package where the graphics are in register with and a color match to the packaging graphics. The resealable tape is applied to the edge of the packaging film in the film flow direction. The tape and the printed, 0.5” width of film are slit away to become the dry edge resealable tape. To form the package opening, the packaging film is slit in the film flow direction, and the resealable tape is applied over the slit in the film, forming the FreshPak resealable feature in the packaging film. Call 1-888-658-7997 for more information about the FreshPak system.